For those too young to remember, it’s worth pointing out that the New Wave Of British Heavy Metal was really no more than an artifice created by journalists. Few if any acts went out calling themselves a NWOBHM band back then; they were hard rock or heavy metal or rock ‘n’ roll or whatever, and that was that. And, to be fair, a point made recently by Stormtrooper’s Colin Bond that in his opinion the NWOBHM was more a period of time than a genre has a degree of validity. 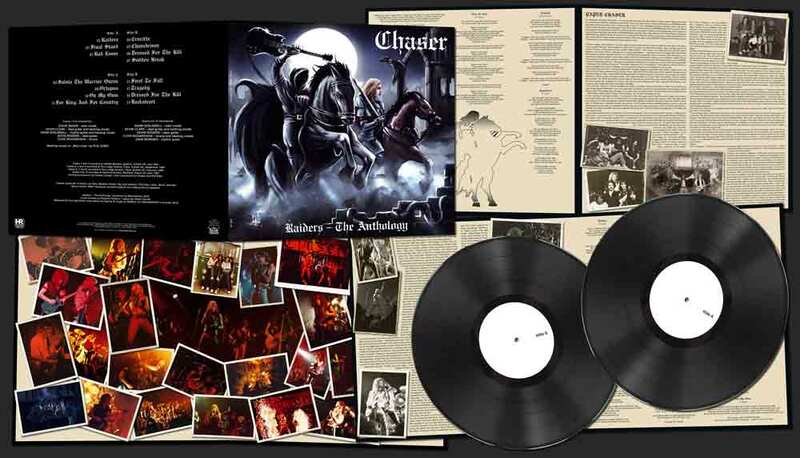 In the course of our discussion Chaser’s Clive Richardson would point out several times that they were never a NWOBHM band, yet their sole single ‘Raiders’ b/w ‘Final Stand’ is about as NWOBHM as it gets in terms of its sound, its style and its attitude. 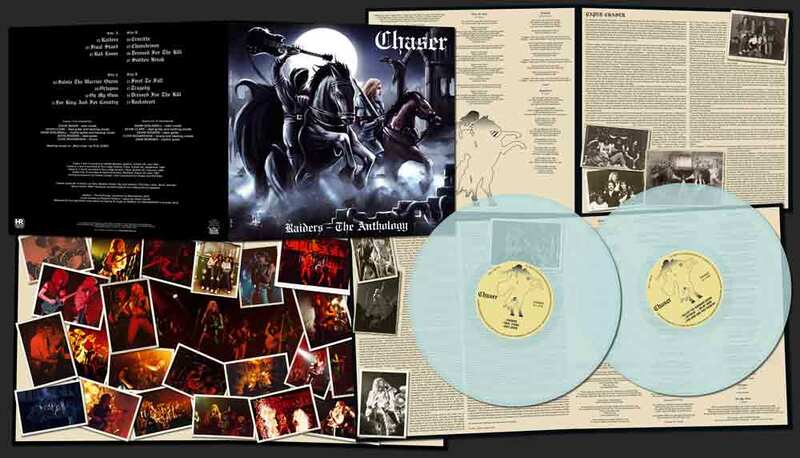 As the elusive record deal remained out of their reach like so many of their contemporaries in the glory days of the NWOBHM Chaser went ahead and did it themselves, and a damn good job they made of it too. Chaser’s legacy is founded on that one highly-prized single and a number of sessions recorded in the hope that a single A&R guy would wash the dust out of his ears and offer them a deal. They received almost no column inches in the press outside of their native Suffolk – the county once referred to by Sounds’ Geoff Barton in an article about Trespass as a “bucolic backwater” – and even the ever-reliable Malc Macmillan had precious little to say about them in his NWOBHM Encyclopedia. Even drummer Clive Richardson, not himself an original member of the band, had to do some homework to bone up on Chaser’s origins. Still at school (and in the crowd a couple of times) in Ipswich when they took their first tentative steps around Suffolk under the name Stormchild – not to be confused with the lads from Lancashire, nor the band who contributed ‘Holocaust City’ to Ebony Records’ ‘The Metal Collection Vol.2’ compilation – Clive was an outsider when the band changed their name to Chaser, a move which took them from the generic to the unique. “Stormchild was formed in 1979 by bassist Kevin ‘Bodge’ Rogers and guitarist Gary Smith,” begins Clive. “At that time they were predominantly a covers’ band. Gary left shortly after to join fellow Ipswich-based rockers Woden Forge, so Kevin Clark joined as lead guitarist and after a couple of other line-up changes, Phil Eden joined on rhythm guitar and lead vocals, with Adrian Scofield on drums. 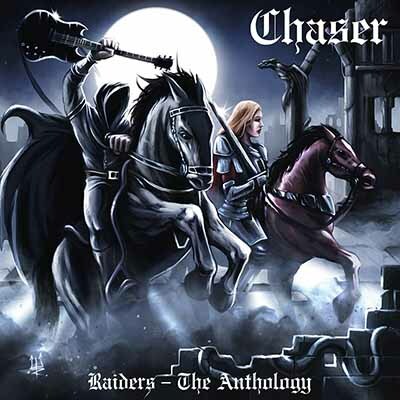 With the addition of lead vocalist Steve Baker, the band decided to concentrate on writing and performing only original material, and at that time the name was changed to Chaser. Phil left and was replaced by rhythm guitarist Nik Wilding, and drummer Paul Read took over from Adrian Scofield. As for the band’s change of name, “I’ve spoken to the other guys about how the name Chaser came about and here’s what they told me. 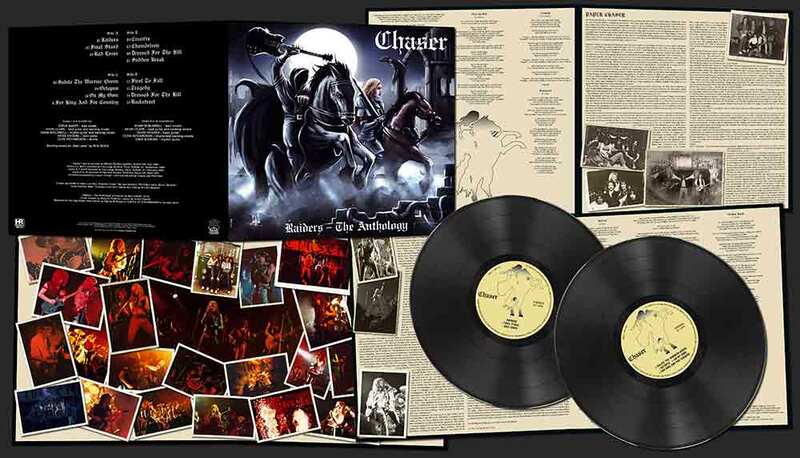 As Stormchild, the band played predominantly covers, and when they made the decision to write and play all original material they wanted a different identity to lose the ‘covers’ band’ tag, so Chaser (as in whiskey chaser) was chosen. There is also a link to steeplechase too, which is why the band used the character on horseback as the logo. Bit of a loose connection, I know, but there you go! Incidentally, two other possible names considered at the time were Triton and Warrior apparently, but Chaser got the majority vote. The other two tracks from the original session that have been lost, Clive confirms, were ‘Light Of The Night’ and ‘Riot In The Streets’. “It had always been an ambition for the band, obviously, like all the other bands of the time, to get a deal,” he continues. “We did contact quite a few labels but we were kind of, well, it seemed like we were stuck in the middle: most labels, the sort of more pop-orientated labels, said ‘you’re too heavy’ and then the other more rock (in inverted commas) labels said we weren’t heavy enough. So we said, ‘sod this, we’ll put a single out. We’ll do it ourselves.’ So that’s why we decided to go for ‘Raiders’ and ‘Final Stand’, it was a democratic decision by the whole band, and we figured that ‘Raiders’ was always a popular live song and was also probably the most commercial thing we had. So September 1985 saw them in The Lodge in Suffolk, the studios owned by The Enid (“Robert John Godfrey is a lovely chap,” Clive recalls) for another session which saw three songs put to tape – ‘Bad Lover’, ‘Chaindriven’ and ‘Crucifix’. The session marked a change in the band, in that more songwriters were coming to the fore. “Kev wrote both ‘Raiders’ and ‘Final Stand’,” recalls Clive, “but, ‘Bad Lover’ was written by Shag and Kev, ‘Crucifix’ was mine and ‘Chaindriven’ was an instrumental by Kev; so those particular tracks were more band-orientated; there was more writing coming from other members of the band. Once myself and Shag were settled in we started contributing. I’ve always written anyway which, I guess, is quite strange for a drummer, but I’ve always been so fascinated by the whole process of writing and recording. But anyway, ‘Bad Lover’, ‘Chaindriven and ‘Crucifix’ saw more of that line-up having influence over the writing side of things. The band recorded one final demo in April 1987, but by this time Steve had left which, inevitably, changed the dynamic within the band. Rather than recruit a new singer, they decided to recruit a new rhythm guitarist. “We drafted in another guitarist to do the recording and he ended up joining the band; that was Dave ‘Bock’ Bowden. We’ve all got these nicknames! [Clive, incidentally, was Jivs. "> So he was the rhythm guitarist for those recordings. Meanwhile, Shag moved onto lead vocals. Shag always did backing vocals anyway, so he did the lead vocals on those seven tracks which also featured a re-recording of one of the 1986 songs, ‘Dressed For The Kill’. “Shag’s singing style was very different to Steve’s. Steve was more into the classic rock kind of style, whereas Shag was more, well, as I mentioned, he was a big AC/DC fan, so his vocal style was more in the upper range, whereas Steve’s singing style was perhaps a bit more laid back, maybe. “But as you said, the dynamic of the band changed after Steve left; it wasn’t the same, I have to say. I don’t think there was any noticeable fan drop-off, we still pulled people and still had blinding gigs. I’m not sure Shag was totally comfortable, though. I think he may have found Steve quite a hard act to follow. I wouldn’t want to upset him, but I think he’d be happy to admit that. I think they were quite big shoes to fill. Image-wise Steve looked great, and he was very cool, and I think a lot of people liked that. Clive admits that as a band they never attempted to move with the times – don’t forget, the band’s lifespan ran through the NWOBHM years to the softer, AOR US sound that was in vogue for a while and then to the growth of thrash. But in doing so at least the band kept their integrity. “Absolutely! And that was very important to us, because we were what we were. As I’ve said, any of the stuff that I wrote you’ll be able to hear a very strong Maiden influence in there, because I was very into them at the time; it wasn’t that I went out of my way to copy them or anything but that was the style that I really liked with a lot of twin guitar. But then you can say the same about Thin Lizzy as well because they were a major influence on the overall Chaser sound too. We worked at it hard for several years, and they were great years. We had good, fun times. Headlining the Corn Exchange, which holds 900, that was great, and we did a few headlining dates there actually. That was an achievement for the band. I wish I could say that we did Reading, or Donington, or places like that, but we didn’t; it just didn’t come about. But we still had a great time. And getting the single out, that was quite an achievement too; and the fact that people are still interested in it over 30 years later is quite staggering. We’re all over the moon that after all this time we’ve been signed and actually managed to get all of our recordings released by a label, and we’re very grateful to Bart Gabriel at Skol Records for his support and for making this album happen. “And personally,” he continues, “I learned so much. I developed massively as a drummer. It pushed me. As I said, I was only 16 and I didn’t have a clue what I was doing when I joined the band, and I’d never done any proper recording. We all learned about recording techniques and we worked really, really well in the studio; we got it off to a fine art. By the ’87 recordings we really knew what we were doing, and that’s something to be pleased about.